The WAND Food and Beverage Taxonomy is another branch that we have extracted from the WAND Product and Service Taxonomy. 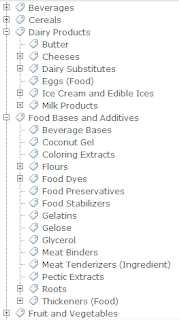 Our Food and Beverage Taxonomy has been available for years and been used by a major food and beverage manufacturer to tag internal research documents for a team of food scientists. But, we haven't put it up on our blog, and wanted to share the news of this taxonomy with our blog audience. 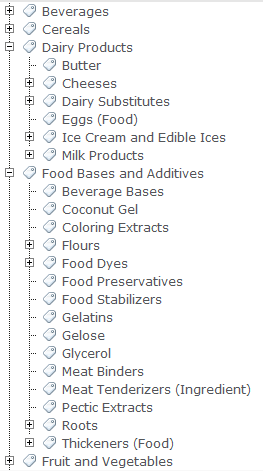 The WAND Foods and Beverages Taxonomy includes 1,278 terms including foods, beverages, ingredients, and additives. Additionally, each term has a unique attribute/attribute value template associated with it which can be used for product attribution. Broadly, this taxonomy includes anything that somebody may consume as food, including some prepared foods and is ideal for restaurants, groceries, and food manufacturers. Anybody interested in the WAND Food and Beverage Taxonomy may also wish to consider the WAND Sensory Taxonomy and the WAND Food Service Equipment and Supplies Taxonomy. Check out the WAND Food and Beverage Taxonomy and all of our other taxonomies at our new WAND Within website, featuring leading technology vendors whose technologies can take advantage of any of the taxonomies from WAND.